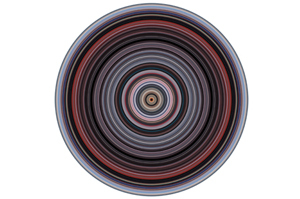 Jason Salavon churns raw data through computer programs to make distinctive art. Salavon started blending art while road-tripping across Texas in his early 20s. The radio blaring in his VW Bug, he thought about what makes a hit song, trying to merge No. 1 songs in his head. Although the musical analysis led to only one piece—an audio CD blending 27 covers of the Beatles hit “Yesterday”—it launched Salavon into a multiyear, multiproject investigation combining photographs that resonated with him personally. His yearbook series, for example, averages all the photos of his high-school graduating class into two prints—one using the men, another with the women—called The Class of 1988 . He also did a set for his mother’s graduating class, The Class of 1967. His series Emblem began by choosing films—2001: A Space Odyssey , Taxi Driver , and Apocalypse Now—“that my dad showed me when I was probably too young” to understand them. The Late Night Triad 2003. This three-part video installation features The Tonight Show with Jay Leno, Late Night with Conan O’Brien, and Late Show with David Letterman. Salavon recorded 64 nights of opening monologues, then averaged each show’s material. The blended videos reveal the sequences’ precision, with a cutaway to the band or Conan’s trademark jump occurring at nearly the same time every night. They also highlight the hosts’ differences. “Leno is such a whirling dervish on stage that his figure never coalesces,” says Salavon, while Conan is regimented: “You can actually see his facial features all lock in.” Letterman falls in between. The Top Grossing Film of All Time, 1x1 1997. 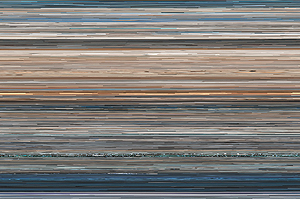 This photographic piece took all 336,247 frames of the hit film Titanic and “smeared each mathematically to a solid color.” Organized in horizontal rows from top to bottom, the frames read from left to right, following the film’s narrative sequence. What remains, says Salavon, is the “visual rhythm” of the film, parsed out in pure color. Leonardo DiCaprio’s “I’m the king of the world!” scene comes across in bright tones, while the sinking ship plunges into gloomier swatches. The Whitney Museum bought the piece, and DiCaprio purchased one of five limited editions for his personal collection. He decided to chance it. Today his digital photography, video, and multimedia projects have been shown around the world at venues such as Chicago’s Museum of Contemporary Art and New York’s Whitney Museum of American Art. 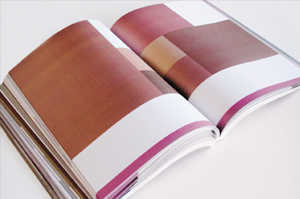 What Salavon describes as his “technology-informed, pop-culture–informed blend” may even be changing how such institutions think about art. 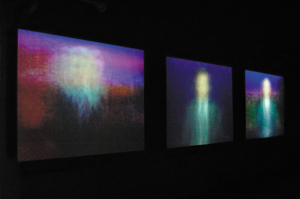 In December 2007 Washington’s National Portrait Gallery acquired Salavon’s The Late Night Triad , a video triptych showing 64 nights of monologues by talk-show hosts Jay Leno, Conan O’Brien, and David Letterman. 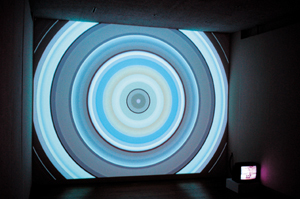 It was the museum’s first electronic artwork in its permanent collection.